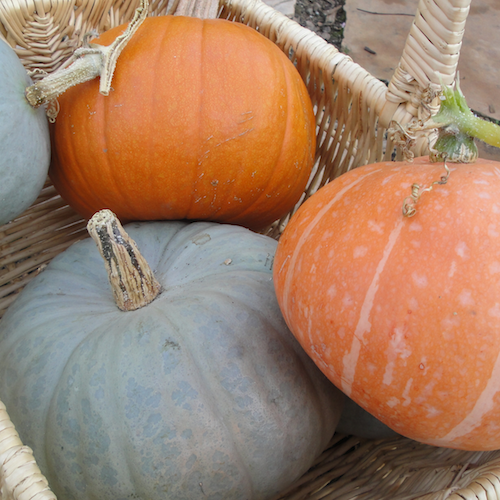 In this photo essay I want to share some special images from my ediblegarden. 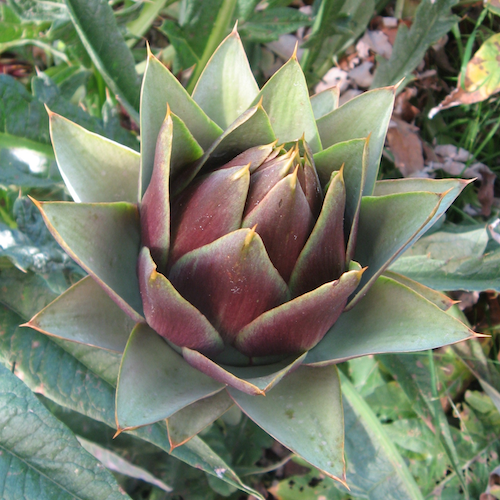 I spent Earth Day working in my garden and as always I was inspired by the beauty of our edible plants. I can't think of a better way to honor our planet than to take time to appreciate and cherish its natural beauty, and that may be as nearby as our own backyards. It's worthwhile slowing down to savor the the unexpected treasures we find there waiting for us, every day. 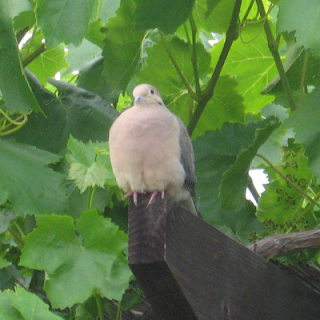 Mourning doves built a nest in our leafy grape arbor and stayed all summer. It’s a bonus that our organic garden is safe haven that attracts wildlife. Winter squashes always amaze with their gorgeous textures, colors, and enormous diversity. This summer I'm excited about growing GuatemalanBlue Banana and Stella Blue Hokkaido. 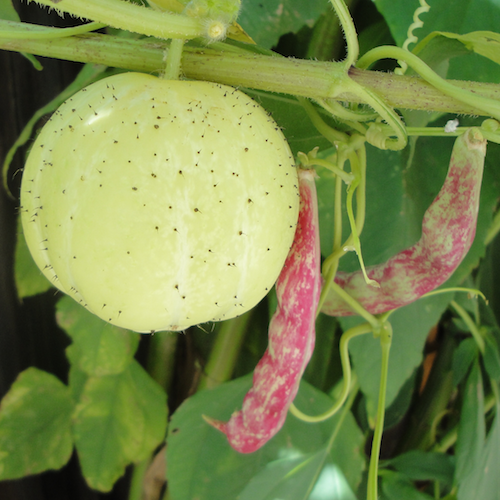 Check heirloom seed sellers for unusual varieties to grow. This Lemon Cucumber and Cranberry Bean both trellised up our tall Jerusalem Artichokes last summer. The trio seemed very happy growing together! 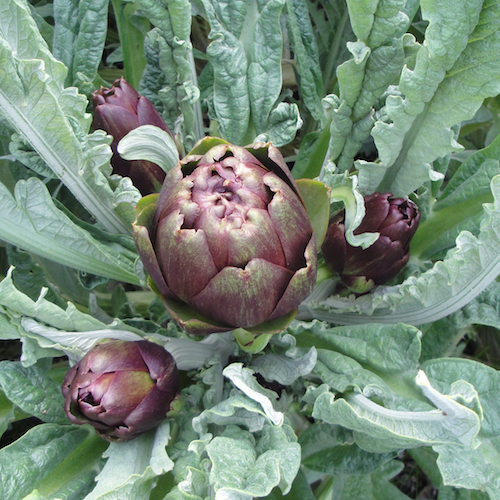 Violet artichokes (Violetto shown above) are truly dramatic and stunning, especially the first time you see them on the huge bushy plant. 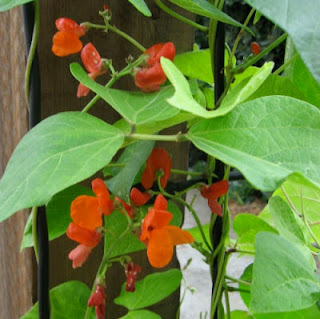 Scarlet Runner Bean flowers are showy and beautiful climbing up on a trellis and can be grown in a container, as in the photo above. I love climbing beans and grow them on pole teepees or trellises every year. May you have a happy Earth Day every day! Jim VanDerPol is a farmer- writer who writes with clarity and skill about how agribusiness has changed not only our relationship with the land and our food, but how our sense of community and connection to one another has been displaced as well. “Agriculture is a human endeavor. We have forgotten this, or have allowed our fascination with our crackpot economy to drive it from our minds”. He has chosen to keep his farming operation small, graze his livestock, and to think deeply about the role of Nature in farming. 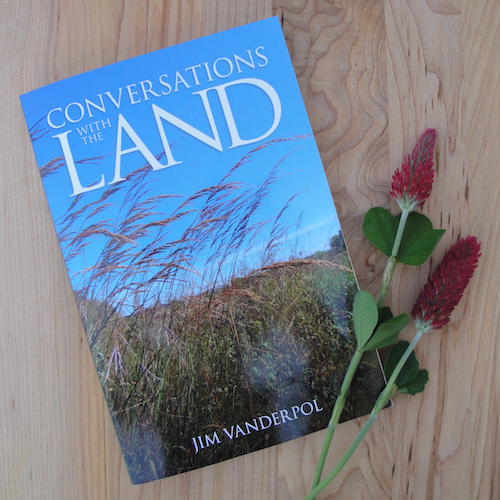 I recently reviewed his lovely book: Conversations with the Land, Jim VanDerPol, No Bull Press, 2012. As I wrote in my previous post, spring kicks off artichoke season, and although I love them best just boiled and served with a dipping sauce of lemon and olive oil, this recipe I adapted from Alice Water’s book, The Art of Simple Food is quickly becoming a favorite. It’s uncomplicated and really satisfying for artichoke lovers. It's an easy recipe for delicious artichokes simply braised with white wine and a few aromatics for flavor. For this recipe I used my beautiful purple Violetto artichokes right out of my garden, but any type will be tasty cooked this way. Dice the onion and trim the green garlic by removing tough outer leaves. Slice it lengthwise in quarters. Rinse the sprigs of thyme and pat dry. Heat a couple of tablespoons of olive oil in a wide heavy bottomed pot (you’ll use the lid later). Add the onions, garlic, and sprigs of thyme. Saute over gentle heat until they are soft, being careful not to burn, about 5 minutes. While the onions and garlic are sautéing, prepare the artichokes by rinsing well under cold water. 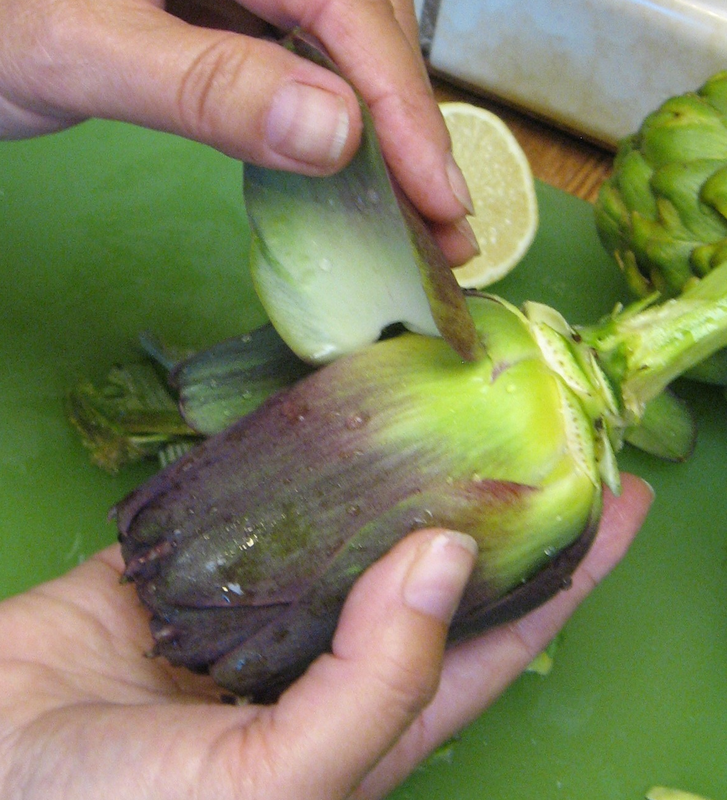 Cut the top third of the artichokes off with a sharp knife, and remove the tough outer leaves of each artichoke by snapping them off. How many leaves should you remove? Here's the thing: you can leave some of the large leaves on, or remove them until you reach the tender light green leaves in the center. It's a matter of preference. The tough leaves will have to be eaten as finger food. If you prefer, use only the tender center of the artichoke, which can be eaten with a knife and fork. I can’t bear to waste perfectly edible leaves, so I don’t mind having to pick off the tough leaves with my fingers to eat the meaty base of each leaf, one by one. Trim the stems by peeling off the stringy surface layer. Next, cut the artichoke down the middle lengthwise, and cut each half once again so it’s in wedges. 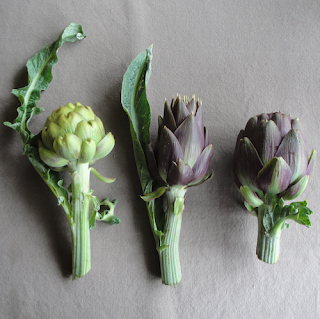 For large artichokes you can cut them again (into eights). Scrape out the choke with a spoon (or carefully cut it out with your knife) or remove it after cooking. As you work, rub the cut sides with fresh lemon juice so that they won’t turn brown. After the onions and garlic are soft, add the artichokes (cut sides down) to the pan and cook for a few minutes (3 – 5 minutes). Add the water and wine and cover the pan with the lid. Cook gently until the artichokes are tender through the thickest part at the base (about 10- 15 minutes). Check them at 10 minutes to make sure there is still some liquid left- if needed add a bit more water or wine. They should be moist and have a couple of spoonfuls of the sauce left when done. Serve the braised wedges by spooning the onions and sauce over them, and with wedge of lemon. This is wonderful as a side dish or an appetizer, either warm or cold. It keeps well in the refrigerator for a couple of days. 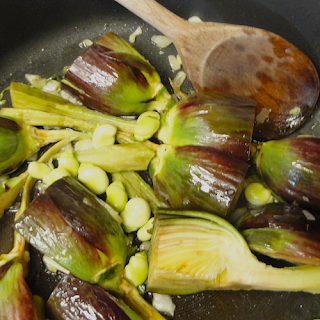 Add fresh fava beans or freshly shelled peas to the sauté when adding the artichokes; use sliced leeks instead of onion. 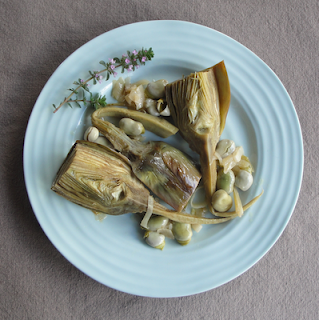 See my recipe for spring artichoke salad.